Struggling with your 5+ of veg and fruits a day? Here is a solution; Smoothies, packed full of vitamins, minerals, fiber, and it adds a great score to the hydration count. True goodness all in a glass, what better way to meet your daily nutritional needs? So here are a few tips to begin.. Blend the mix as briefly as possible, this prevents oxidation which contributes to decreasing the nutrient content. Blending shouldn’t take any longer than 2 minutes even with the a underpowered blender, it takes me about 30 seconds to blend; start at the lowest speed until a chunky puree forms and then finish off on high for a few remaining seconds to smooth off. Prepping saves you time, you can wash and cut the ingredients into containers so it’s all ready to be dumped into the the blender. Buy and freeze fruits in season to keep. Peel, deseed fruits you normally would, then store in an air tight container to freeze, it’ll keep for months. I usually buy bags of spotted bananas for freezing, not only are they cheaper with age it’s also when you get best nutrients out of them. Avoid canned fruits at all cost, these are predominately sugar laced. Green smoothies are a great for kids too, get them involved in the process by taking them out to the grocer and choose fruits and veggies for coloured themed drinks. If you’re in the rush, leave washing the blender until later in the day. Fill it with water and let it soaking in the sink, you’ll find cleaning a while lot easier too. Most recipes will call for milk or tea infusions, this can be swapped around ,or substitute with water, if you’re opting to go dairy free you can always for use almond milk, rice milk, hemp milk, coconut milk, oat milk, coconut water, whatever you fancy really. Vegetables may be a hard for you associate smoothies with, give them a chance they add a great mix; spinach, celeries, kale, broccoli are great for starters. 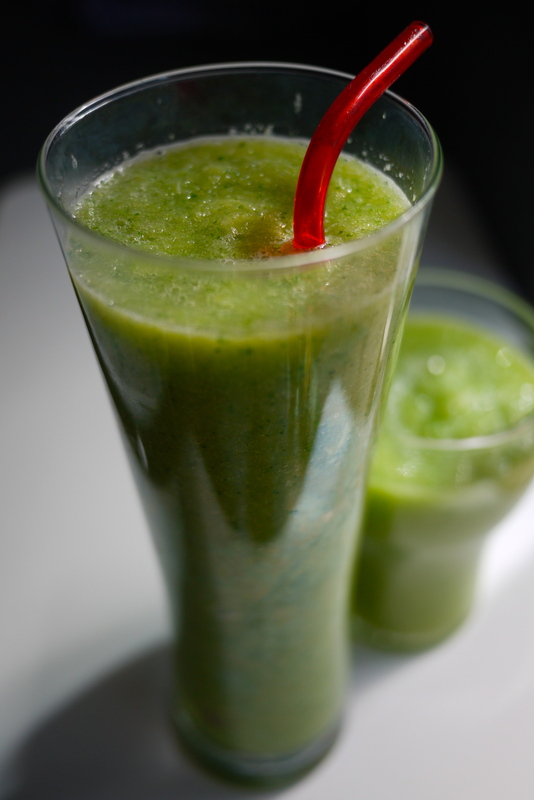 If your smoothie is too thick for you liking – you can thin it with a little water, milk, or tea. To thicken you can add a little yoghurt, banana, protein powder, chia seeds, or oats to the blend. Say you made too much? make popsicles, it’s a great for snacking. BPA free popsicle moulds are easy enough to get from places such as Ikea. There is a lot to touch on when it comes to optional add on’s, generally protein powder,spirulina, wheat grass, maca, acai, bee pollen, nuts and seeds such as Linseed Sunflower Almond (LSA) are great for fiber and extra nutrients. Spices such as cinnamon, tumeric, ginger, cacao powder has great properties and great for flavour changers. Agave, honey, and dates can sweeten up the smoothie. These are good for starters to begin with, when purchasing look for ingredients in it’s purest form, I’ve seen some dehydrated berries and protein powders with added thickeners, colours, and sugar added. eeeew! Broccoli is a good source of beta carotene, vitamin C, folate, fiber, it’s also great source of calcium for those who do not consume dairy products. The cruciferous vegetable contains a wide range of phytochemicals which protect against many chronic diseases as well as cancer. To select broccoli, choose florets that are compact and not bruised. The head should have a uniform colour without the presence of any yellow flowers starting to blossom. The stalk and stems should be firm and ensure the leaves are not starting to wilt. Best way to keep broccoli is to have it placed veggie bag snd store in the refrigerator, it should keep up to a week. Alternatively you can also freeze broccoli by cutting it into smaller pieces as you would stir fry. Wash, and blanch with hot water for about 3 minutes. Plunge into cold water to cool. Then drain well, pack, and freeze. Broccoli can be kept frozen for up to a 9 months. 1 Apple, skinned, seeds removed and cut up into pieces. 1 Pear, skinned, seeds removed and cut up into pieces. 5 Broccoli florets (about 100g). 2 celery stalks cut into smaller pieces. Place all ingredients into the blender, start at the lowest speed until a puree forms, turn the blender on high for last remaining seconds. The blending should take about 30 seconds, try not to over do it. Recipe serves as two portions, you can choose to share, freeze, or keep a portion as a booster for later in the day. Next PostMalaysian Kaya (Coconut Jam) Recipe.